Redecorating has been done! And I can finally sit at my new desk, plan and write blogs and also start filming videos for you all again. If i'm honest this year i've been all over the place. A lot has happened and I finally can feel like I am settled and able to do what I love most. 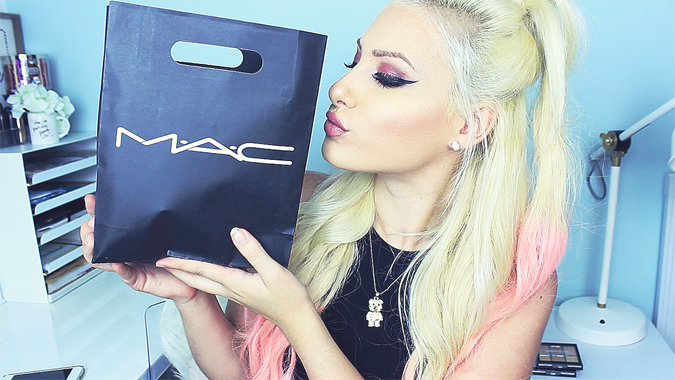 MAC Cosmetics just opened in MALTA!!! Yes, you heard correctly, I remember opening the newspaper classified one day in April whilst on holiday to visit family and I squealed with excitement! Knowing that it's so easy for me to get my favourite brand on this little tiny island is amazing. Now I have to be honest, I didn't jump on the "Go cray cray at the MAC Counter" like everyone did, because it's here forever (I hope) and with everyone going cray cray as I mentioned before, 9 times out of 10 the best sellers will be out of stock. As you will be able to see from the video below, I didn't purchase much. My only intension was to get my lovely mumsy a birthday treat so I picked up a Lipstick and Lip Liner for her and obviously treat myself to just two things myself. If I had to talk about Prices, In my opinion we have the upper hand as we are slightly cheaper than Britian hands down! And if you are subscribed to their Paid Pro Card System the Discount is greater than UK! (bonus there)!! Do have a look at what I bought,my thoughts and a little chit chat in the below video, I would like to start up my blog on a more weekly basis so stay tuned for updates on this blog of mine.